Mish's Global Economic Trend Analysis: Wading Through Molasses: "Did the Real Economy, Not Counting Government, Expand in Last 20 Years?" Wading Through Molasses: "Did the Real Economy, Not Counting Government, Expand in Last 20 Years?" I received an interesting question from reader Michael yesterday. Michael asked "Did the Real Economy, Not Counting Government, Expand in Last 20 Years?" Reader Michael did not think so. Take a moment before reading further to think about how I might answer and how John Williams at Shadowstats might answer. If the average standard of living has gone up, then we have had growth. Better cars, more cell phones, bigger houses, better stuff in general, says we have had growth. In spite of inane inflationary policies of the Fed and corruption in politics everywhere, rising productivity over time was the enabler of growth. However, some of that growth has been at the expense of debt (and future expansion). We have borrowed growth from the future. Those expecting a return to high growth are mistaken. Yes, I would agree with that, absolutely. However, monetary inflation has so distorted prices and made the growth look far bigger than it really was. Essentially the problem is that the market economy must constantly battle against the destructive policies of governments and central banks. It is like wading through molasses. If you look at the actual improvements in the standards of living in more detail, most of it has to do with the computer industry in the widest sense. Even improvements in health care can be put down to increased computerization. Hi tech remains the one area that develops so quickly, the political class is too slow to regulate it to death, and the central banks cannot keep it from providing better things at lower prices, because its productivity growth is so fast it more than balances out the negative effects of money printing and credit expansion. In virtually every other aspect, there are at most a few improvements due to the expansion in international trade, but little else. To Pater's comment I would add that protectionists in Congress, countless Keynesian economists, and unions everywhere seek to label China a currency manipulator, then add tariffs. Doing so would instantly kill any growth due to trade expansion. Also recall that Republican nominee Mitt Romney ran on that destructive platform. In 1997 Krugman wrote a brilliant article "In Praise of Cheap Labor", stating "Bad jobs at bad wages are better than no jobs at all". I wrote about Krugman's position in Fair Trade is Unfair; In Praise of Cheap Labor; Are Bad Jobs at Bad Wages Better than No Jobs at All? Please check it out. Krugman "was" right. However, the definition of "was" requires one to go back to 1997. Somewhere along the line Krugman acquired the "conscience of a liberal" and he has been wrong ever since. 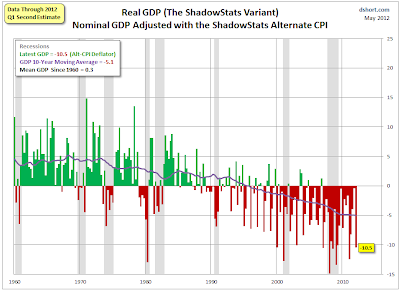 Let's also take a look at GDP as measured using Shadowstats CPI as the deflator. Please consider GDP, Real GDP, and Shadowstats "Theater of the Absurd" GDP. All of the hyperinflation calls have been missed by a mile. I wrote that back on May 31, 2012 so the chart is dated. But it would not look much different now, adding only another two years of recession. On March 25 2013, Doug Short wrote Regression to Trend: Debunking the Alternate CPI. Doug's post contains a more recent version of the above GDP chart. It also contains additional commentary well worth a look. Here is a chart and some of Doug's comments. I'll close with one more example of why I completely reject the Alternate CPI as a valid metric. Let's consider real median household incomes since 1967, the year of the earliest Census Bureau data. Adjusted for inflation using the government's CPI, the $7,143 median household income has only risen 4% from 1967 to 2011, the latest full year of Census Bureau data. 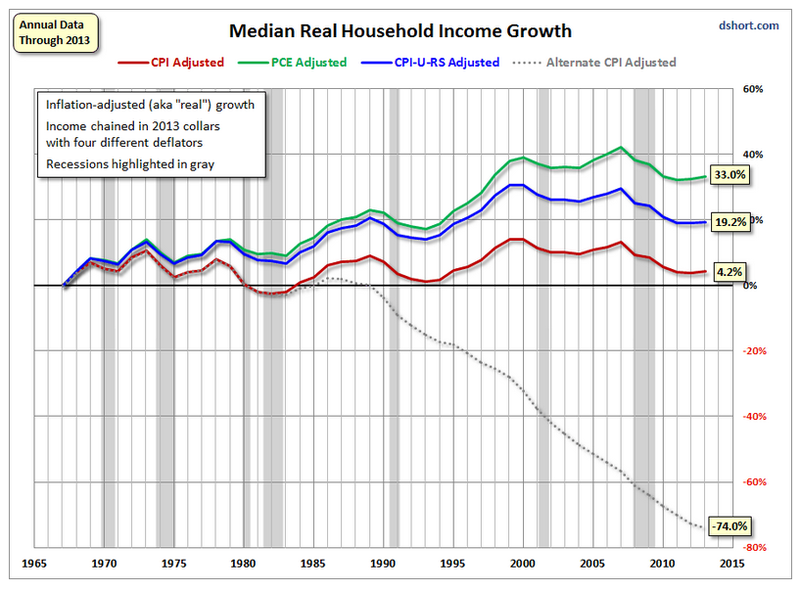 If we make the inflation adjustment using the Shadowstats Alternate CPI, the median household income has declined by 70%. 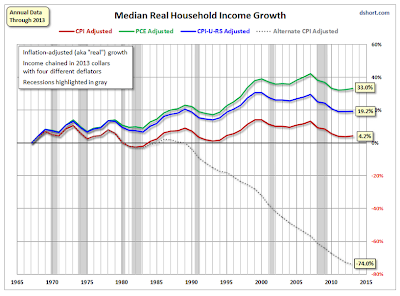 As I commented when I originally posted this household income chart last year, the Alternate CPI is a completely bizarre outlier. What this deflator is telling us translates into something like this: If we chain the 1967 median household income of $7,143 in 2011 dollars, it would have had the purchasing power back then of $166,683. 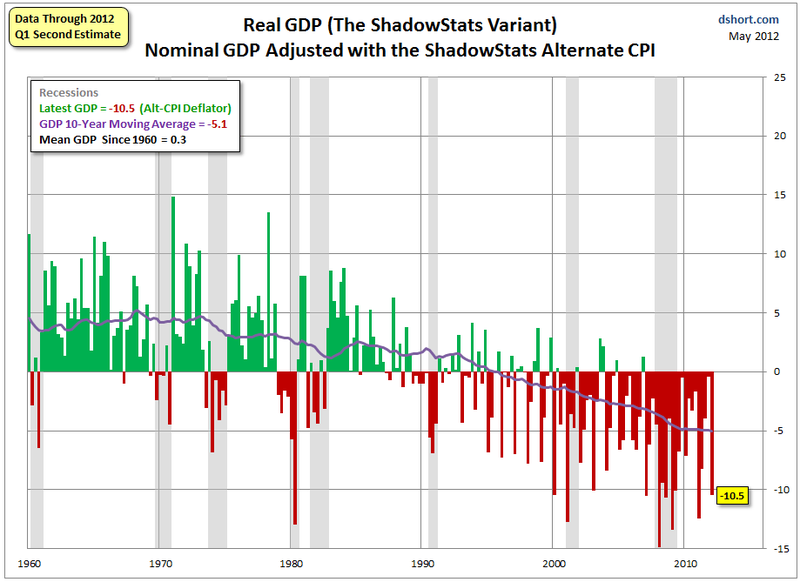 Unless one buys the shadowstats CPI theory, there has indeed been growth. Perhaps that growth has been overstated by a little, perhaps by a lot.The fact that the central banks including the Fed have so distorted pricing mechanisms makes it hard to tell. Regardless, there are easy-to-see implications of past actions on future growth. Effectively we have borrowed current growth from the future. Looking ahead, growth surprises will be predominantly on the downside for years to come. Here's an interesting observation from reader Charlie Smith at Fort Pitt Capital Group: "The average US citizen is living 5 years longer than 35 years ago. What is more valuable than life?" Lacy Hunt at Hoisington Investment Management responded "Some people are going to have a real hard time when the CPI prints zero or possibly even slightly negative over the first half of this year. I see that you did not forget the inflation/deflation debate at the Casey Conference last September in which you and I participated on the deflation side. Warm regards, Lacy."